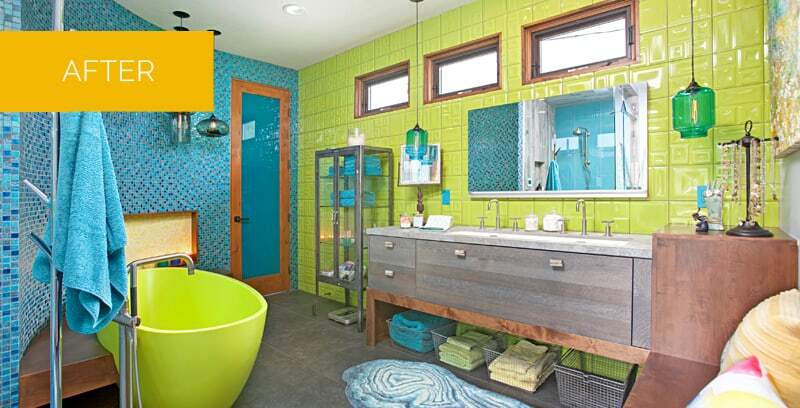 Designed for a young professional woman with a love of unconventional color, this refreshingly individual master bathroom was inspired by the home’s location near the beach and by a favorite painting, “Francesca,” which now hangs on a wall in the room, establishing visual unity in the space. This dramatic design started with the decision to build a curved wall in sparkling tile, wrapped around an eye-catching free-standing tub in chartreuse. Throughout the room, alder wood elements balance the bright colors with the earthiness of wood.